ARVADA, Colo. -- Hundreds of students walked out of classrooms around suburban Denver on Tuesday to protest a conservative-led school board proposal to focus history education on topics that promote citizenship, patriotism and respect for authority, in a show of civil disobedience that the new standards would aim to downplay. The youth protest involving six high schools in the state's second-largest school district follows a sick-out by teachers that shut down two high schools in the politically and economically diverse area that has become a key political battleground. Student participants said their demonstration was organized by word of mouth and social media. Many waved American flags and carried signs, including messages that read, "There is nothing more patriotic than protest." "I don't think my education should be censored. We should be able to know what happened in our past," said Tori Leu, a 17-year-old student who protested at Ralston Valley High School in Arvada. One student put it simply to CBS Denver, asking, "Where are we without our education?" The school board proposal that triggered the walkouts in Jefferson County calls for instructional materials that present positive aspects of the nation and its heritage. It would establish a committee to regularly review texts and course plans, starting with Advanced Placement history, to make sure materials "promote citizenship, patriotism, essentials and benefits of the free-market system, respect for authority and respect for individual rights" and don't "encourage or condone civil disorder, social strife or disregard of the law." The proposal from Julie Williams, part of the board's conservative majority, has not been voted on and was put on hold last week. She didn't return a call from The Associated Press seeking comment Tuesday, but previously told Chalkbeat Colorado, a school news website, that she recognizes there are negative events that are part of U.S. history that need to be taught. A student demonstrator, Tyrone G. Parks, a senior at Arvada High School, said Tuesday that the nation's foundation was built on civil protests, "and everything that we've done is what allowed us to be at this point today. And if you take that from us, you take away everything that America was built off of." The proposal comes from an elected board with three conservative members who took office in November. The other two board members were elected in 2011 and oppose the new plan, which was drafted in response to a national framework for teaching history that supporters say encourages discussion and critical thinking. Detractors, however, say it puts an outsized emphasis on the nation's problems. Tension over high school education has cropped up recently in Texas, where conservative school board officials are facing criticism over new textbooks. Meanwhile, in South Carolina, conservatives have called on an education oversight committee to ask the College Board, which oversees Advanced Placement courses, to rewrite their framework to make sure there is no ideological bias. The College Board says the outline provides a balanced view of American history, and officials plan clarify instructions to teachers to make that clear by the end of the month. 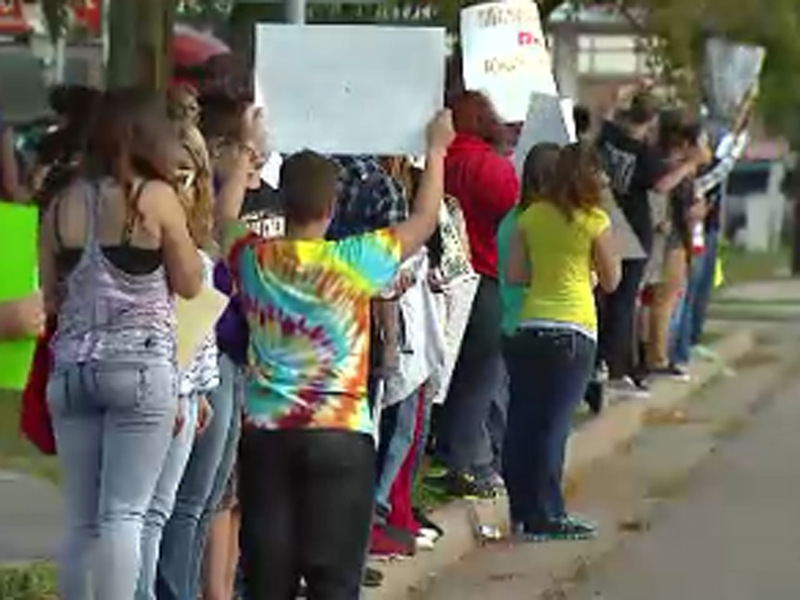 Participating students were not punished, school district spokeswoman Lynn Setzer said. They will receive unexcused absences unless their parents call to relay permission for missed classes, Setzer said. Superintendent Dan McMinimee has met with some of the students and renewed his offer to continue discussions on the issue. "I respect the right of our students to express their opinions in a peaceful manner," he said. "I do, however, prefer that our students stay in class."